Ecover Ocean bottle, its inspiration, and FEM showing performance with and without biomimimetic solution. The blue image on the left weighs 30 g and the one on the right weighs 25 g. Image by Loloplaste Innovation Lab. Nature is full of elegance. Sometimes that elegance, to human eyes, also appears as great beauty. But being beautiful isn’t (except maybe when attracting mates) the purpose of that elegance. Nature is elegant in its designs because that elegance has a function. Carlos Rego, a designer with Logoplaste Innovation Lab in Portugal, has found functional patterns in nature that have added beauty to his designs for something as utilitarian as a bottle. Those same patterns added strength while decreasing weight — and therefore material — from those bottles. And recently, the organisms that inspired the company’s latest design may also benefit from it. 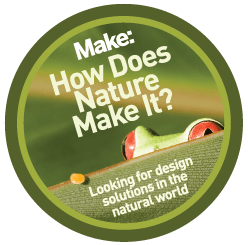 This story is about learning from nature how to minimize materials while still providing needed strength, how to cooperate, and how to design to make products that are not just less harmful to life, but are also restorative. I first met Carlos over Skype, when I heard about the Vitalis water bottle he designed using biomimicry and a strategy he found on AskNature. The strategy showed how a pine tree has a spiral pattern to its trunk and limbs that provides strength for the tree to withstand high winds and heavy snow. When applied to the design of a bottle, it reduced raw material usage by 7 percent. I next met Carlos when he took an 8-month Biomimicry Specialist course that I helped teach. Toward the end of that course, he told me about his next biomimicry project, and that design is now on the market. Ecover, a company that makes effective, plant-based cleaners, approached Logoplaste to come up with a biomimetic bottle that would accomplish four goals: 1) use biomimicry in its design, 2) optimize the bottle’s weight while preserving its mechanical performance, 3) be attractive and otherwise meet branding needs, and 4) use waste plastic recovered from the ocean for at least 10 percent of the bottle’s content. Carlos was enthusiastic about Life’s Principles (see my last post), and applied those to this design as well. Diatom. Photo by FWC Fish and Wildlife Research Institute. 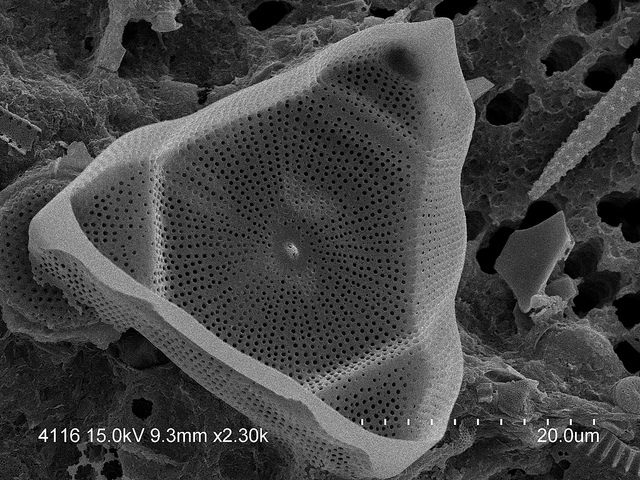 From the diatoms — aquatic, single-celled algae — Carlos learned that their intricately patterned cell walls contain rows of tiny holes that create a silica lattice. When a compressive force is applied, the force radiates along the lines of the lattice to another, stronger structure. The holes also mean less silica, a resource that can be scarce, is needed. He applied this strategy to the bottom of the bottle. 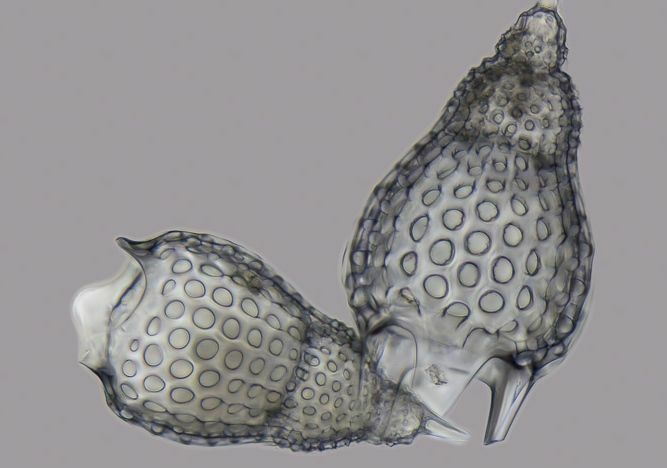 Similar to the diatom, the radiolarian’s weight and strength are optimized using holes. Carlos learned that the shapes of the holes in the radiolarian’s skeleton are different depending on the curvature, with hexagonal or round holes being important on curved surfaces. He applied this strategy to the sides of the bottle. Together, these two strategies increased strength of the bottle under compression, allowing a reduction of weight from 30 g to 25 g, while also adding a unique look to the bottle and providing a good gripping surface. Radiolarian. Photo by Frank Fox. Radiolarians and diatoms live in our oceans and are important sources of energy for organisms a little bigger than they are — up to the size of baleen whales. As Carlos says, “We’re not just doing biomimicry, but using it as a tool to improve knowledge of people about these organisms.” Ecover is in a partnership involving recycling facilities, manufacturers, packaging developers, and fishermen whose boats have been outfitted to collect waste plastic from the ocean. This cooperative effort has disproven claims that ocean waste plastic can’t be used a raw material.